Mike Rother sent me a link to this article and said it was worth reading. You did so good a job of tieing together ideas that many of us have had — like the problem of finding problems in the current state which is partly a disease that comes from the kaizen event movement which always looks for isolated problems to fix in a workshop. I enjoyed the article and will post it at my linked in website and refer my students to it in my winter course. This was a timely read for me. Our current LECP class is just focusing on VSM and this post makes the case so well for the need to align improvement activities with a challenge and a vision to actually create a management system and sustain any improvement and development efforts with a lean learning culture. So Kaizen bursts must be drawn in the future state map not in the actual? 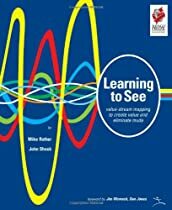 I though that they have to be drawn in the actual state map, but it is true that in the book Learning to see ar drawn in the future as they represent the things we have to fix in order to achieve the future state. What matters is how you go about determining the future state. 1) Understand the challenge or business imperative. What MUST you achieve? 2) Grasp the current condition – understand why the process performs as it does. These two steps give you context for the future state. 3) Map out a future state which would meet the imperative. 4) Identify what parts of the process must operate differently to achieve the future state. (Kaizen bursts). I actually don’t care where you draw them. What is important is when you draw them. 5) Break down the various loops and identify challenge and direction required for the responsible leaders to achieve the improvements identified.